Students all have different goals they want to achieve in their English language learning, and if building academic vocabulary is your goal then you’ll want to do it as easily as possible. There are some specific problems you will meet when you want to develop your academic language and here is some advice to help you. DO read academic books and journals. Even though reading fashion or celebrity magazines may help your everyday English vocabulary, they won’t do much to help with the specific language you will need for academic purposes. This can be a problem. 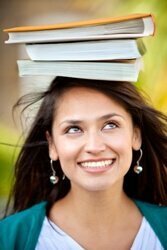 Academic articles on the web, textbooks or research papers will be much more useful to you. Have a dictionary with you when you read, and look up words you don’t know. DO pay attention to phrases. Academic language isn’t just about individual words. It is about how those words are joined together. Some people concentrate too much on single words and neglect phrasal verbs, idioms and collocations. DO practice. This can be problematic because you can’t easily practice academic language in daily life. If you did, people would think you're a little strange! You can practice writing though, and you should try writing longer, well constructed essays when you can. If you don’t have a teacher to check your work, ask a friend. If you don’t have any friends to ask, then compare your work with articles you find on the web. But remember that some of the articles on the web aren’t too good so try and find some from sites with a good reputation. DO look at vocabulary to help you organize your writing. Discourse markers are words which help give signposts to our writing. Examples are, firstly, in contrast to, and in conclusion. If you learn and use these, your writing will be much easier to follow. DON’T neglect the little words. Prepositions, such as to, in, on, of, about, etc are often forgotten and these are important in academic language (as well as in general English usage). Conjunctions are also important. You will be familiar with conjunctions such as and, but, because, so, etc but you will need to start using more advanced words such as whereas, moreover, despite, in spite of, and so on. Pay attention to these when you are reading. Underline them in texts to concentrate your attention on them, instead of skimming over them. DON’T forget the tone. Formal vs informal English can be tough to get right, but academic vocabulary is often much more formal than everyday vocabulary. For example, you would be more likely to read the word children than kids in an academic text. When you discover a formal equivalent of a more informal word you know, then add it to your vocabulary notebook. DON’T forget the language specific to your subject. Each subject has specific language and you should have a section in your vocabulary notebook for words particular to your subject. If you read as much as you can, and practice as much as you can, as well as following the above tips for building academic vocabulary, then your Academic English should grow and improve.